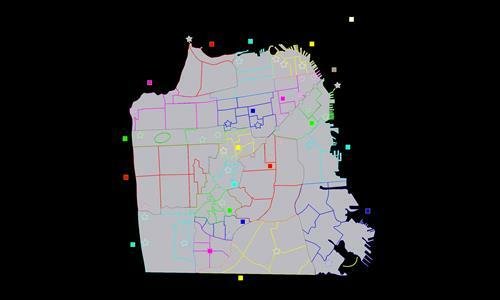 A map of San Francisco with landmarks and working Muni Stations. Review by Krulle on 11/12/2013. The typical problems of city-maps reduced very well, the rail line integrated wonderfully. Review by Nathan on 11/6/2013. Well done. The bonus areas are large but manageable. You have an interesting array of non-adjacent bonuses, as well. The rail line adds a nice dimension and keeps defenders on their toes. Great concept with excellent execution. Thanks! In a later version I'm working on right now I broke down some of the larger bonuses into more manageable chunks. keep an eye out for v2 sometime in the near future if you like the map. Edit: Version 2 is out now. Review by Apache Rose Peacock on 12/7/2013. San Francisco lends itself well to a warlight map. The fact that you can move armies between metro stations is a nice touch. Review by ersatz on 12/9/2013. This is an excellent map. The landmarks are a cool idea and the underground muni stations were executed flawlessly. Review by warhawk on 8/18/2016. There are the inner "stars" within certain territories that are part of the bonus areas which can be both easy to take, OR, it just might turn into a nightmare. That makes this map one of the most exciting in Warlight. I've rated over 90 maps, this is only the 2ed map that I gave a 5 Star rating to. Great job. Review by agoldredshield on 12/3/2013. Review by barakobama on 3/8/2014. Review by [V]one on 1/29/2014.